I am a city girl. I was born in a large metro city, Chennai, moved to another, Bangalore, for academics; Then back to the first for a job; Then to Tokyo for work and finally landed in New York City where I lived for 12 years.... Before giving up the city entirely.. For the country!!! Ok, really the suburbs, but could be the country for all I knew! I have lived, and continue to live, in awe and deep respect of my maternal grandparents, their amazing talents at work and at home! Ok, I exaggerate. I moved up the East Coast corridor to Connecticut. It is not really that different from the Chennai I grew up in. It has houses and gardens or yards as they call it here. Large amounts of space that seemingly only have grass and boxwood growing in them! For perspective, I grew up on a similar sized land in Chennai and that was covered in fruit and coconut trees, vegetable patches all over, burgeoning with flowers and fragrance. My grand mom was a whiz at all things home-making and she had the greenest thumb I have ever seen. My grandparents garden was always my dream....! You see, I was a city girl, headed for corporate greatness or at the very least a pay check stable, long hour job in some big city. Never did I think that I even had a dream, until it was offered to me. At first I rebelled and the only consolation to my moving out of my beloved big city and all its distraction was the singular opportunity to live my unhoped for dream... Testing if I had even an iota of my grand mom's genes! At this point, I may as well confess... I have lived and continue to live in awe and deep respect of my maternal grandparents - both of them are demi gods to me in terms of their skills and talents! So, having a garden was paramount to a move out of NYC and it was only further fueled by my year in Italy, whence, was the first time, I lived outside a big city. To begin though, I had a black thumb. Several attempts at herb growing when I lived in Manhattan had failed, well, because, I did not water the plants in any routine. Then, living in Brooklyn was my first breakthrough. In the small fire escape landing outside the bedroom window, I grew herbs, peas, tomatoes and even a single butternut squash (until it was feasted upon by squirrels! I didn't know enough them to protect the young fruit..). Truth is, with all of these plants, except the herbs, I was in serious competition with the birds and squirrels of the neighborhood. But, the ability to see green was a huge confidence boost. I could give life. Oh Joy! Hence, the planning began. In early March, I tried picking a spot to plant. Sadly, most of the yard was overgrown. And, it was still snowing with 3 Nor'Easters scheduled to land just that month! So, planning garden space was a pipe dream at that time; I could barely walk on the ground outside! Instead, I used the time to read up as much as I could. I wanted to grow herbs and tomatoes ofcourse. I also wanted zucchini, squash, onions and flowers! I was ambitious! Push myself and all. 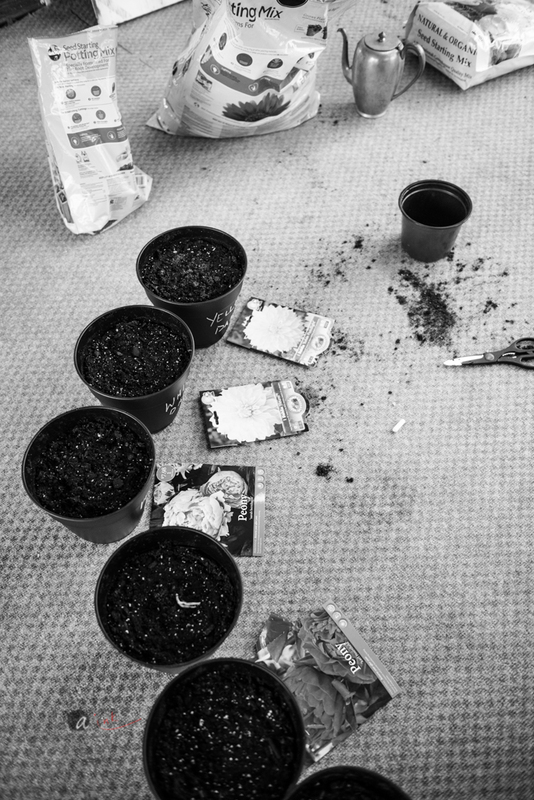 First thing to do was start seeds indoors and understand planting times for different plants. For example, peas like cooler weather and can stand frost but tomatoes and peppers will survive a sudden frost. And, they need more heat to stay healthy. Mid-March I started the seeds indoors. Staggered over the month (see notes below on when to start), I planted peas, onions, tomatoes and pepper in little seed trays and watched them anxiously till they sprouted. Fortunately, the house has a lot of windows and so keeping them in the sun and indoor warmth was easy. Still I found as the weeks stretched and the seedlings tried to grow, they grow long and limber striving to be closer to the sun. This happens since they don't get enough heat from the sun filtering through the windows. The only solution to that is hardening them slowly by keeping them outside when the temperature is above 50F and full sun during the day and bringing them back in before the temperature drops. 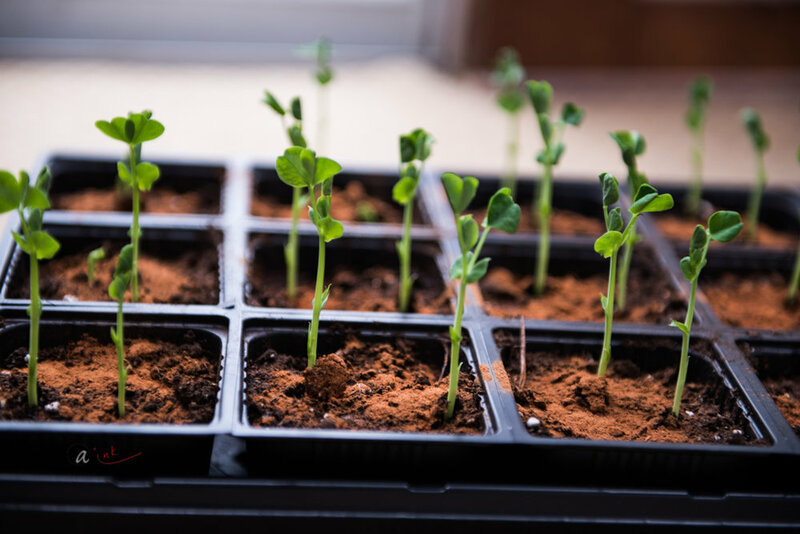 Peas can be planted before the last frost as soon as the ground is workable. I did none of this. Because, I don't like working a frozen ground, sure. But mostly because I had no ground to work on. So, my seedlings stayed inside till early May when we suddenly had Summer weather for a spell. More on that in the next post. Below, I have shared some learnings from my first two months of indoor garden starting. 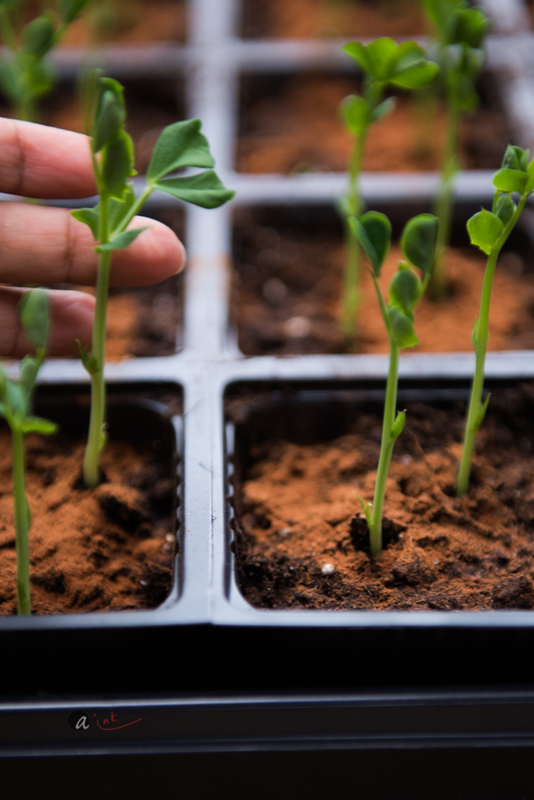 Peas can be planted in seed kits or directly in soil, depending on when you start. They germinate very quickly. Mine germinated in 6 days. At this point you can transfer immediately to ground, if it is workable. If you keep them inside, they start growing rapidly too. That is ok, just keep them in a sunny spot and even the temperature dips below 40F, they will be fine. I have read sprouted seeds are faster to grow. For this you would soak the pea seeds overnight till little sprouts are seen and then plant directly in soil. I simply planted them directly in the seeding soil as I had all the time! Start the tomato seeds 6-8 weeks before the last frost date. My seeds germinated in 9 days. To be fair, I would even recommend starting as early as 10-12 weeks if you are in a cold zone. They take a while to grow to transplantable size. Mine are 9 weeks old, today (May 18) and I still think they need another week of strengthening. It is also a factor of the weather we are having. As soon as you can, weather the plants by bringing them out into the natural sun even for 30mins - 2 hours a day as possible. I left mine indoor for 4 weeks and they grew rather tall and spindly. Not the end of the world but better if you can harden them. I did all single variety heirloom tomatoes because I did not want to try too many seeds, given my first time. If you want a crop through the entire Summer season, seed and plant different varietals, so produce at different times. Cherry tomatoes, Roma, Beef steak etc, all have varying time to maturity. I started 6 seed pots of sweet peppers and 6 of spicy. The spicy ones take longer to germinate but they catch up pretty quick. I had little issue with plant height or any growing concerns with the peppers. So far, they have been the easiest to grow. 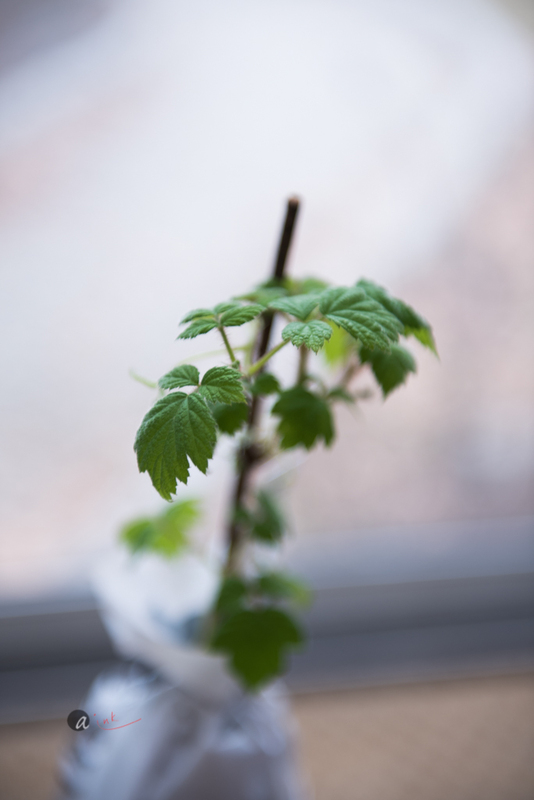 Early on, I also bought a raspberry and blackberry plant from the market. I have yet to plant them. Also on non-edibles, I bought bulbs of some of my favorites - Peonies, which also happen to be deer resistant (big factor for me!) and Dahlias, which are not, but we shall see! I hope you like this series of posts. I am planning to post these as often as I have something to update. Next post will be about May when a lot of the action kicked off and the whole project accelerated! Please do let me know what you think of these posts, and what you would like see/read more of!